“Crazy Rhythm” was written for the 1929 musical Here’s Howe. It’s been a popular standard since it was written and has been heavily recorded, not just by jazz and popular artists, but other genres including hillbilly. Significant recordings include those by Chet Atkins, Les Paul, Stan Getz, Bing Crosby, Bix Beiderbecke and Whispering Jack Smith. 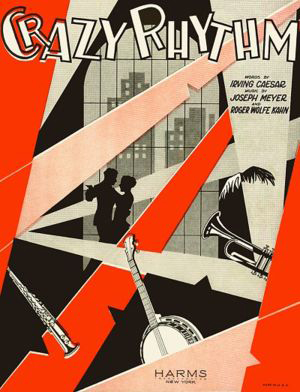 “Crazy Rhythm” was recorded in October, 1949 as a demo recording. It was arranged by Tony Tamburello. No copies of this demo disk are known to exist. “Crazy Rhythm” was recorded on June 27, 1957 and released in 1957 on the album The Beat of My Heart. It was arranged by Ralph Sharon. “Crazy Rhythm” was recorded on July 18, 1967 as part of the “Broadway Medley” and released that year on the album For Once In My Life. It was arranged by Torrie Zito.